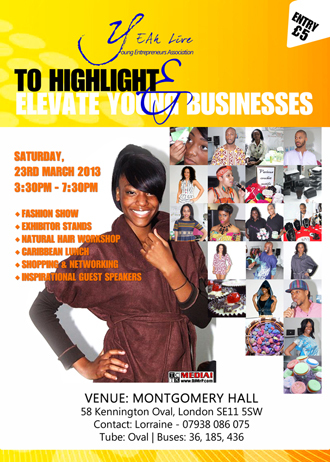 Young Entrepreneurs Association is pleased to to announce that the third YEAh Live will take place on Saturday, March 23 at Montgomery Hall, Kennington Oval, London. The aim of YEAh is to bring the youth together so they can progress forward by interacting with each other and being guided by the older generation. So the budding photographer can link with the aspiring model, these two can meet the new designer, these three can meet the stylist, these four can meet the fashion blogger, these five can meet the new PR person, the events manager, the new web designer, the accountant, the book-keeper and the secretary/admin person etc. This is all while learning how to present themselves in the best possible light to the right people. Lorraine James, founder, Young Entrepreneurs Association, said: “My vision for YEAh 2013 is for our young people to experience the full advantages and benefits of networking, gain confidence to showcase their talent and products and receive mentoring, guidance and nurturing along with forged partner links to make their business plans viable. My wish is that their period with YEAh is like a caterpillar incubation period and when they become butterflies I can say to myself with satisfaction “I’m glad I could help”. YEAh Live aims to fulfill the business needs of ambitious young people aged from 18-30 demographic, who have business ideas and want to make that important first step to take their dreams to the next level. 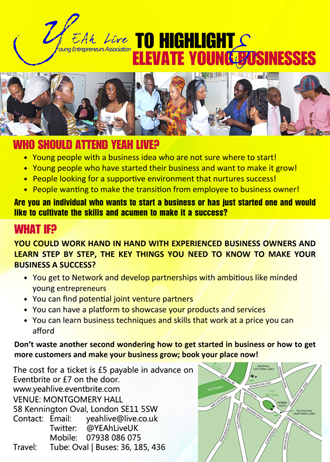 This event will give you the opportunity to meet, network, build interpersonal skills and learn from relatable business owners and entrepreneurs making their businesses work.